Edwards Pedersen Collection of Works of Raymond Rowley King » Man Evolves. An article about King may be found here: http://news.google.com/newspapers?nid=1948&dat=19641018&id=Mf8tAAAAIBAJ&sjid=E4AFAAAAIBAJ&pg=2692,3097055and is reproduced here. Raymond Rowley King, who became an artist and sold $24,000 worth of works while in prison, has fled to Sweden in violation of his parole. But officials say it is unlikely they will seek extradition of King, 37, who served three and one half years on a narcotics conviction before being paroled a little more than a month ago. John J. Cullen, head of the parole division, said the artist obtained a passport.Parole and police records are not checked before a passport is issued, Cullen said, and Sweden lacks a visa requirement. King disappeared soon after he opened a studio in San Francisco.Some critics said his oils show near genius. He learned to paint in the California Medical Facility near Vacaville, Solano County. King was the key organizer among the prisoners in the establishment of art shows which have attracted nationwide publicity to the medical facility.There is at least one inaccuracy in the article. According to Victor Heady, King had attended the Chouinard School of Art in Glendale prior to his conviction. He had entered that college because he thought it would be a good way to meet girls. Heady also told me that King’s parole officer had advised him to leave the country because he was going to get a parole violation for being “dirty” … using heroin. 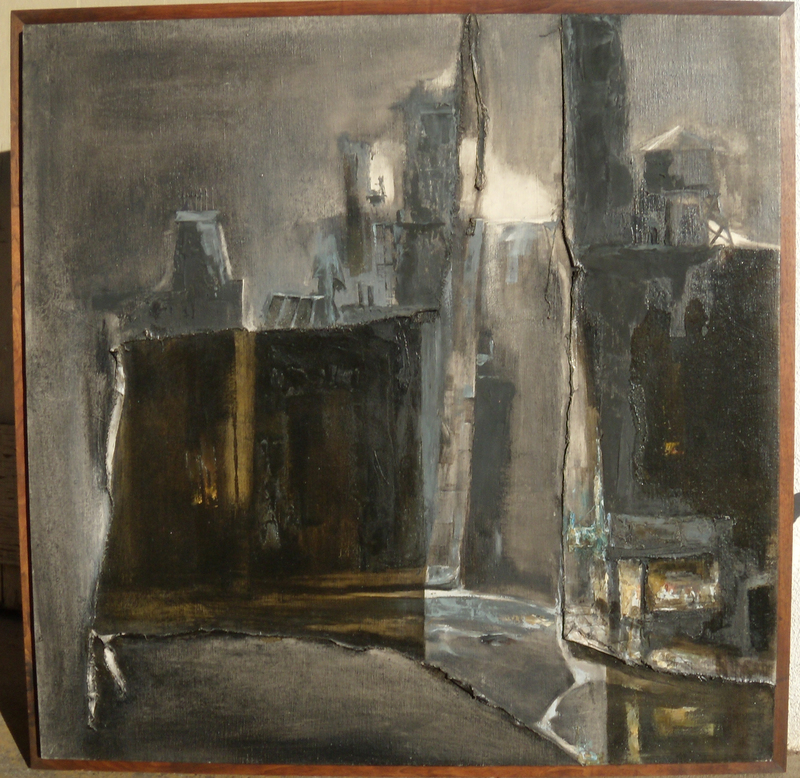 Our first painting by Raymond Rowley King was purchased in 1963 from the Barrios Gallery in Sacramento. Benny Barrios had purchased it from an art sale at Vacaville Medical Facility. 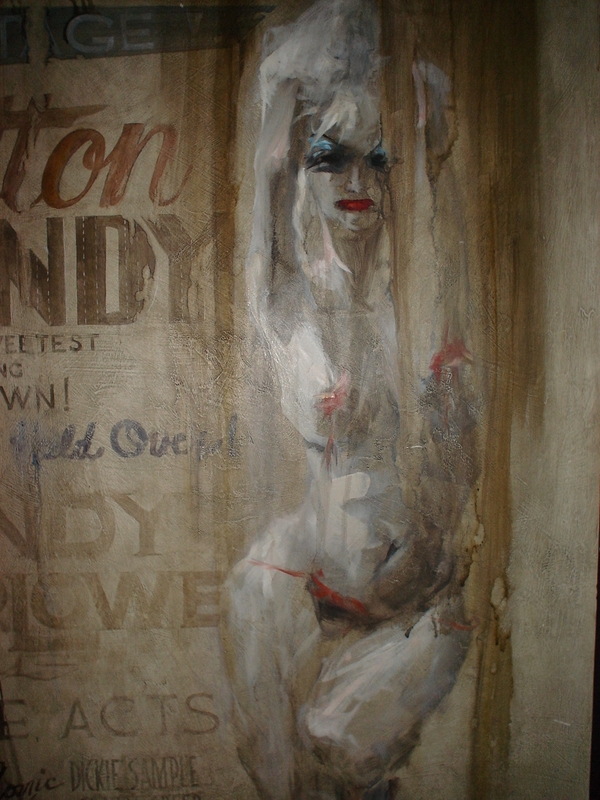 This one is 40″ high by 48″ wide and is done in oil on ¼” tempered Masonite. 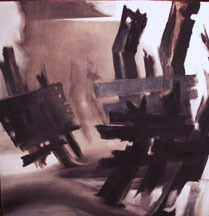 It is a depiction of a restaurant on pilings at the edge of a bay. It consists of a shed built on to an old street car. A man stands at the back and is throwing a tub of dishwater out into the bay. Fog is whisping by, represented by cobalt-umber-gray scumbles. 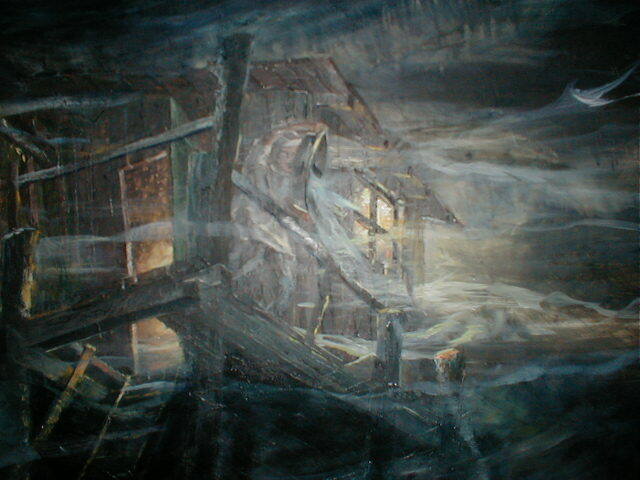 Shed detail showing man throwing a tub of dishwater into the bay. The end window identifies the structure as a streetcar. Note the neon sign in upper left corner. It is seen from the back side. The work has a lot of the dark tones of the one of the restaurant on pilings. There are scumbles of fog moving past. I have described the subject as a cargo vessel, but now that I have looked at it again, it has some of the characteristics of a trawler. The oil painting measures 45½ x 8½ inches on Masonite and is set forward on a frame of rough wood. There are three known works using the subject matter of an old-fashioned country doctor making a house call in a horse drawn buggy. This one is 48½ x 48½ inches oil on canvas. 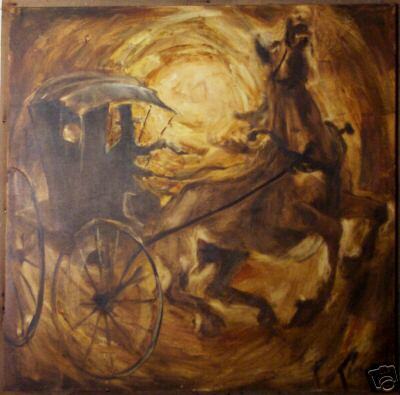 In this painting we see a powerful horse controlled by the driver in a tall hat. Ray liked to wear tall hats. In at least three paintings on the subject a man in a tall hat is controlling (a) horse. The word “horse” has sometimes been used to mean heroin. 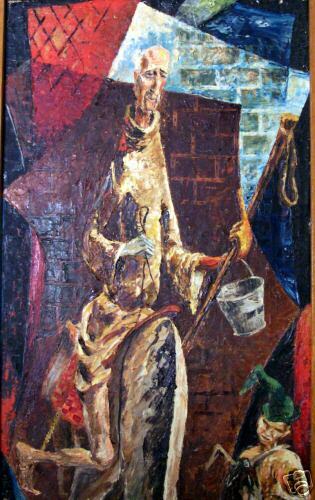 There is a picture of Raymond Rowley King at work on a painting. It must be from some newspaper article of the time … around 1963. Ray would have been in prison at that time. 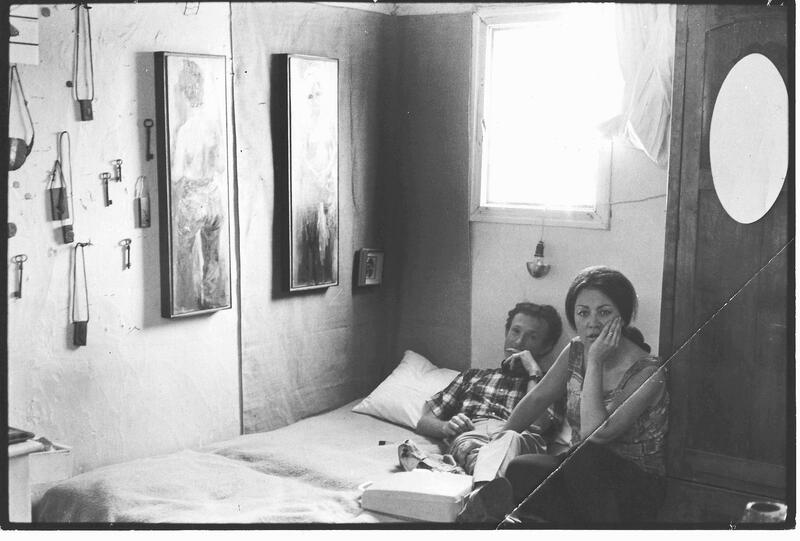 Another picture of Raymond, with his wife at the time, Happy” was given to me by Ray’s second wife Ebba. I am most appreciative of the glimpse in to his life in Israel. 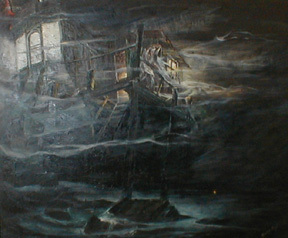 Among the more recently acquire works are two scenes that are of a nautical theme. 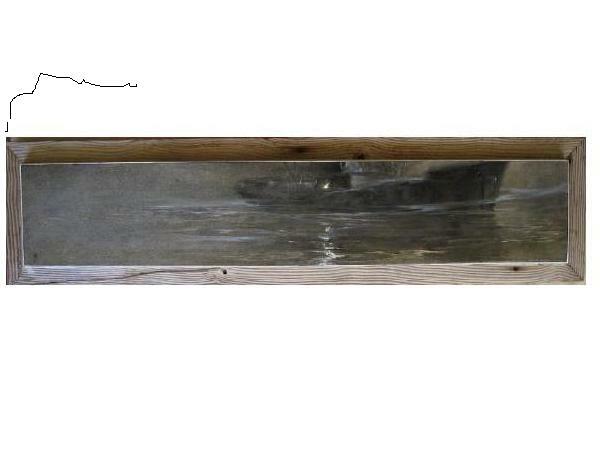 Sea Poem was acquired from an auction in Oakland, California. The title contains an obscure reference. This work is only slightly small that Sea Poem and was purchased in the same year. 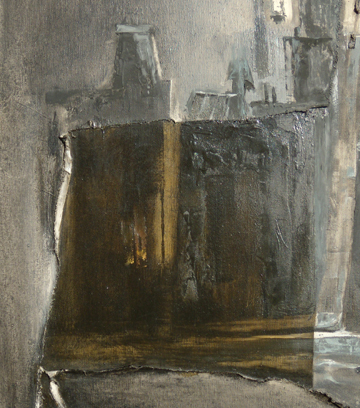 A third painting in this series was acquired early in 2013. It is also titled Sand Spit. I have received one or two works through the auspices of eBay, and I shall present them here. This was up at auction in Denmark and I was outbid for it. It subsequently appeared on Ebay. It was sold to me for a higher price, but not too princely a sum. I find it to be quite exquisite. I was contacted by someone in Ohio whose father or uncle had been something like a step-brother to Ray … something like that. I purchased from him four smaller works. One was of Don Quixote and his sidekick (or squire) Sancho Panza , both astride horses. In a detail of the lower portion, we see a rather whimsical horse with its head resting on the pavement. Pancho’s steed appears to be a donkey. 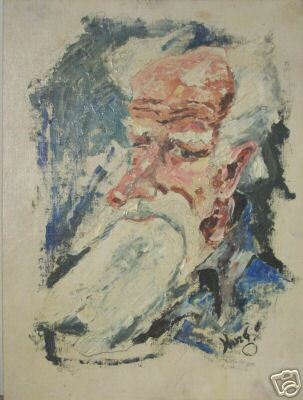 An image of an old man painted by Ray has been identified by someone who knew them both as being of Ray’s grandfather, who lived in Oregon near Grant’s Pass. There is a well know bridge over the river in Gran’t Pass. According to one story, Ray’s grandfather was a bit of a bush pilot, and flew his small airplane underneath that bridge. If you know the bridge, you will appreciate that this would be quite a stunt. This portrait is done with heavily impastoed oil on a canvasboard measuring 12 inches by 16 inches. It has been commented that the look of the man is stern, as if to say, “Ray, you have strayed from the path. 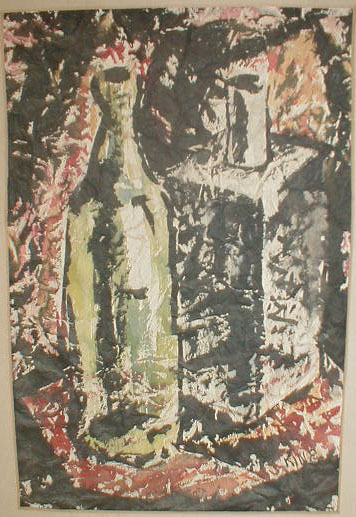 An additional early work is of two bottles and is done on thick, heavily wrinkled paper stock of the kind used on drawing pads. I am not certain as to the type of paint is used. The density of the pigment gives the paint an opacity not often found in watercolors. 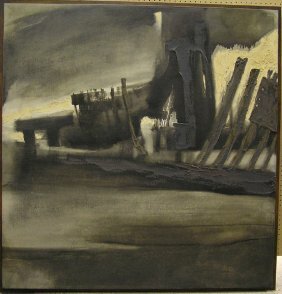 This unframed painting is irregular and roughly 8 inches by 12 inches. Taped to the back is a note that reads: I offer you an old port wine bottle & a Gilbey’s gin. Or possibly Vermouth – Martinis? From the same source comes a piece titled Star of the Show. Of course, the star is Ray Himself. In a detail from this work, you may see a resemblance between this self-portrait and the image of Sancho Panza. One of the most difficult purchases was an item offerred up at auction in South Africa. An email arrived one day from Johannesburg, South Africa. 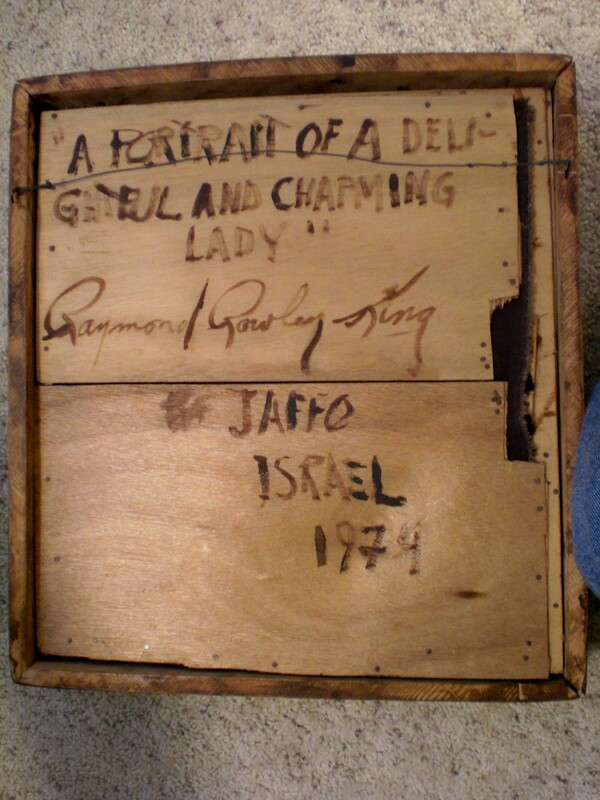 It was from an estate auctioneer who had one of Ray’s works for sale. We agreed a price and I was able to get the money to him using a cashier’s cheque in SA money and FedEx, but there it sat. 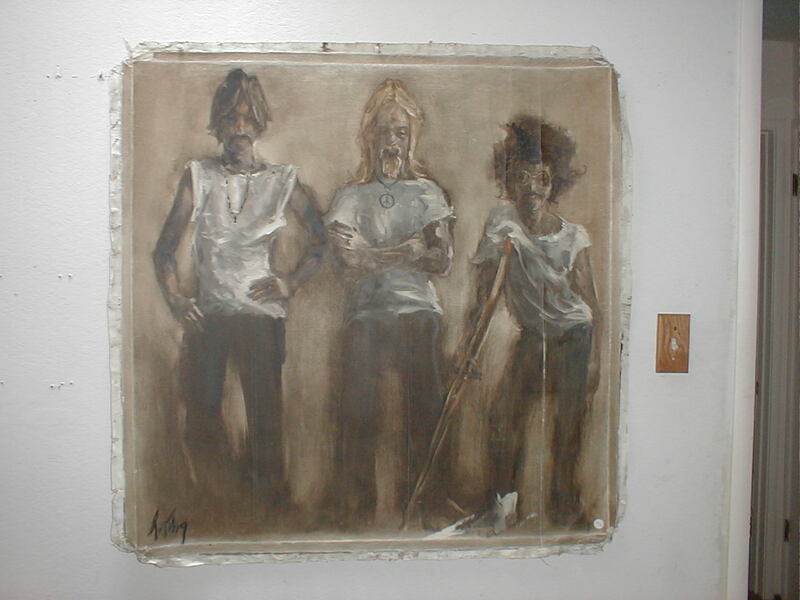 It was barely 36″ x 36″ and done on canvas in Malmö, Sweden in the late 1960s or early 1970s judging by its subject matter … three hippies. The auction house owner wanted no part in moving it out of that country to California. It was a challenge that I accepted. 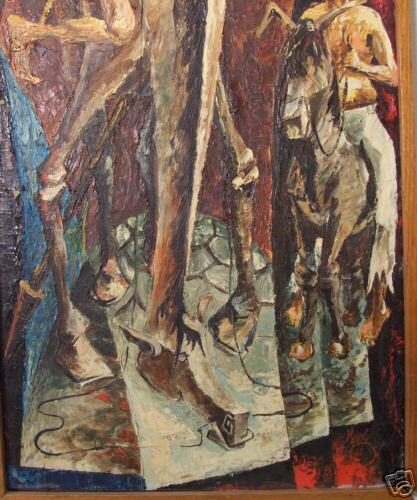 I went to blogspot service in Joburg and found someone who was willing to go to the auction house to pick up the painting, then remove it from its stretcher bars, roll it up and ship it to me on my corporations FedEx account. To pay him for his efforts it was necessary to transfer money to the PayPal account of a friend of his from England who would reimburse him. That worked out alright. Once the painting arrived, I inquired of FedEx as to the charges so that I could pay for them myself (so as to not pierce the corporate veil, you understand). No charge from FedEx was ever forthcoming. 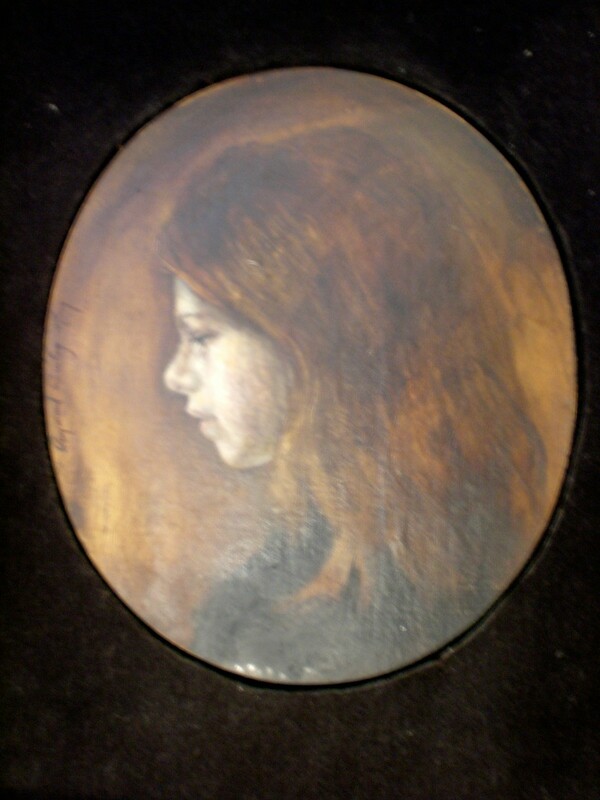 This small “cameo style” work is done with oil on Masonite, cut in an 9-1/2″ x 11″ oval and sanded down along the edge. It was done in 1974 in Yaffo (Jaffo), which is now a part of Tel Aviv in Israel. 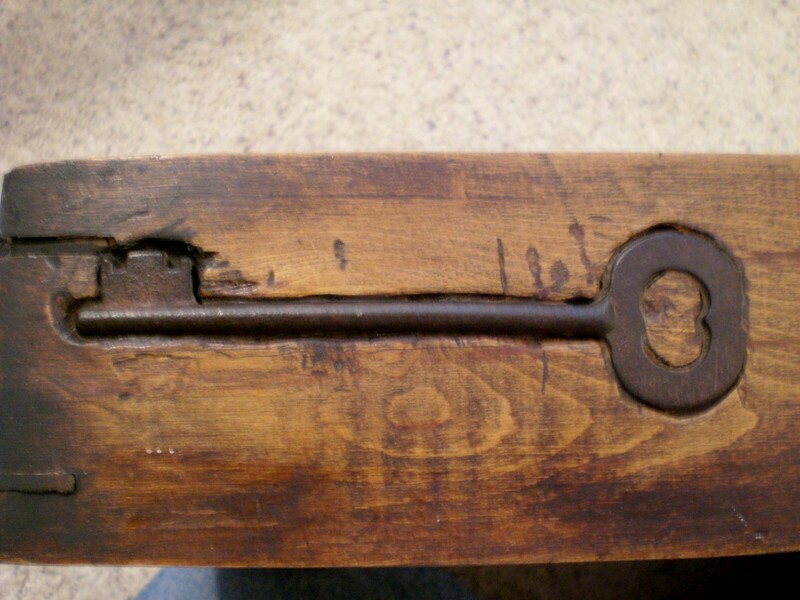 Ray liked to decorate with keys. He would hang them by bits of cord on nails stuck in the wall. On the lower left of the photo above, you can see a rectangular tab coming in from the edge. This is actually a finely made L-shaped piece of wood with both parts of the “L” being the same length. There are eight of them … two on each corner holding together the dark wood frame, which is 1/2″ wide and 3″ deep . It was a very precise fit when it was constructed. When the painting is hung on the wall, the key is embedded on the right hand vertical side near the bottom. I have received word that the Delightful and Charming Lady, who is the subject, was Jane Krivine. 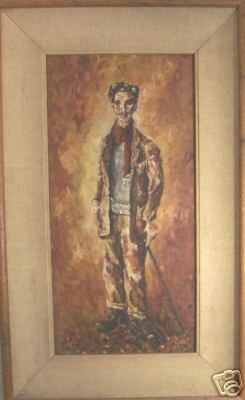 Her father collected other painings by Ray and had commissioned this portrait, but did not like the finished product. Just in from Atlanta, Georgia, is the Sweetest Thing in Town. The dimensions are 48 inches high by 36 wide and it is painted to look like a torn and wrinkled poster of the kind that would be sloppily pasted on to the side of a building or fence. Dated September of 1963, this would have been painted while Ray was still confined to Vacaville Medical Facility. 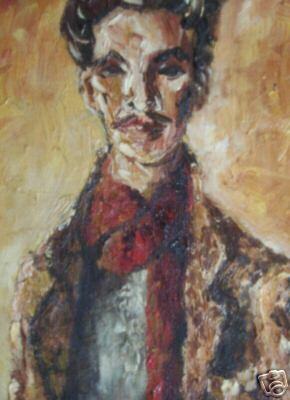 As with many works of that period, it is painted in oil on 1/4 inch tempered Masonite. This was also painted in September of 1963. On February 14 of that year, Ray completed this large work, a cityscape titled A San Francisco Tapestry. The dimensions are 47″ x 47″. 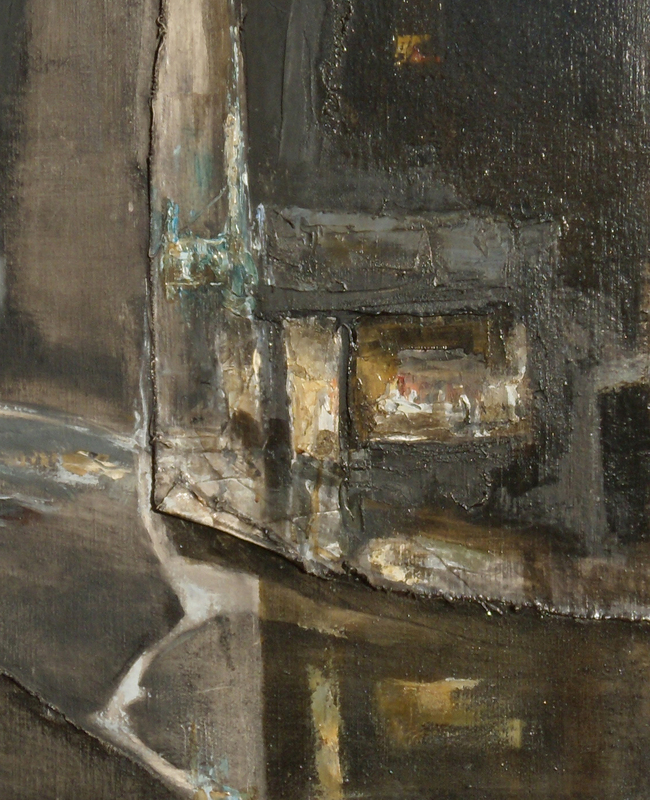 It is not only painted on canvas, but a second layer of canvas of matching size, but with an irregular section torn out of it has been glued to the main canvas to give a layer of texture to the painting. To illustrate the second layer of canvas with the large section missing, here is an image with a white line indicating approximately were the second layer has been cut away to expose the first layer. Written on the back, as a subtext, are the words, “Height * Ashbury District”. (Ray would have known how to spell “Haight”.) There is some little story that came with the work. Ray, who was still in Vacaville Medical Facility at the time, is said to have explained that it represented his imagination of what the world looked like outside of the prison walls. San Francisco is rather densely packed visually with one building butted up against the next so that lightwells running vertically between the buildings is the only thing that breaks up the gloom inside. 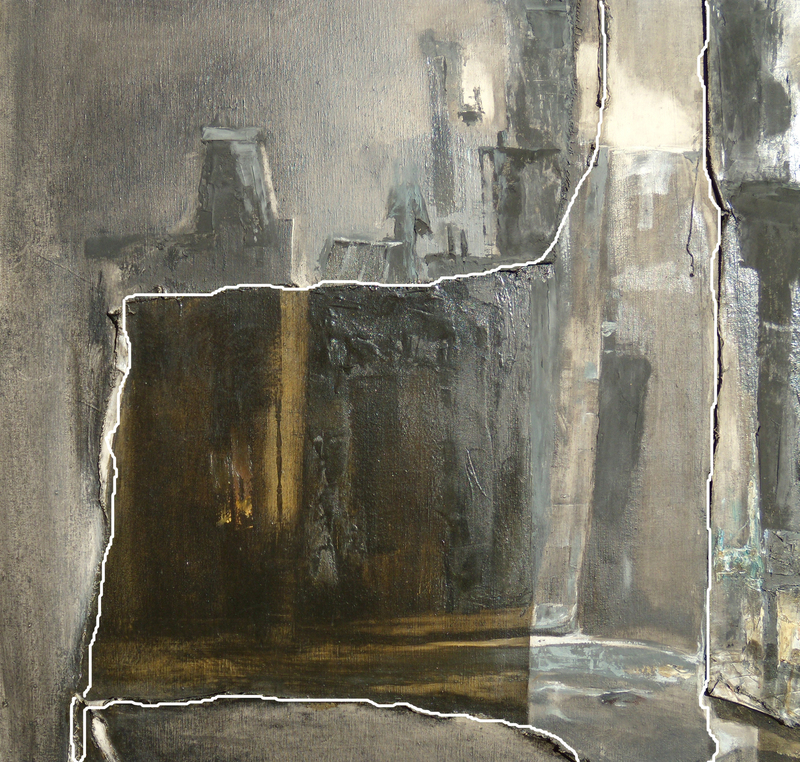 Yet, in this piece, the elements are isolated and uncluttered by other competing elements. Buildings stand alone or in pairs to demonstrate the contrast in architecture and mood. That some structures appear high above others is a way of indicating the terrain of The City. 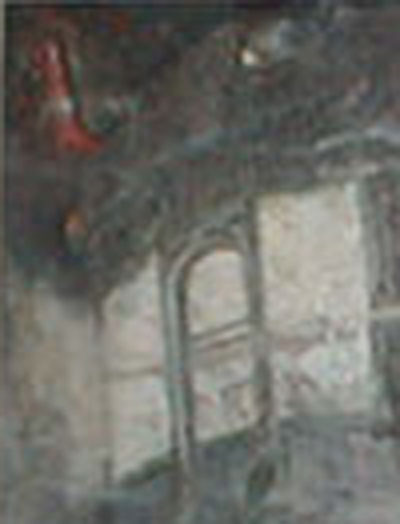 In the lower right corner there appears to be a store or perhaps a restaurant that remains open in the nighttime, its internal lights reflected on the wet pavement. Above the store, there is a light in a window. In the upper right there is, in the background, a single Victorian house and, to the right of that, the roof of a commercial building upon which is a water tank. Finally, two details of the left side of the painting with a block of added canvas to which varnish has been applied. This is in contrast to the umber staining in the background. 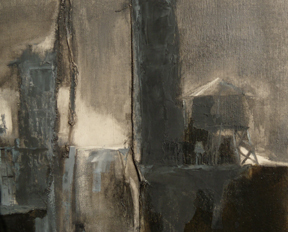 The two elements, which are partially highlighted by varnish on the first layer of canvas, appear also to be houses of a kind numerous in San Francisco … tall, slender and with pipes and chimneys shown on rooftops and odd bits of architecture sticking up to the sky, as is evident on the house on the left. The slant-sided structure on the rooftop has decorative iron grill work across the highest horizontal surface … the kind with sharpened iron spikes pointing upward. Atop the house on the right is a Mansard-shaped skylight and some chimneys. A slender Victorian house seems to be growing out of its roof. It has been raining and light bounces off of the street reflecting, in the lower-right-detail, the lights of the store. One is tempted to step in out of the rain and purchase some fresh apricots, a large chocolate chip cookie and a bottle of German wine: a Zeller Schwarze Katze or perhaps a Niersteiner Domthal, or, if it is an eatery, to have some latenight chop suey. Is that a cat in the lower left … or just a reflection? The left and rignt sides are formed by slashes of white where the first layer of canvas is exposed. Its “ears” are white paint on the rolled over back side of the second layer of canvas. 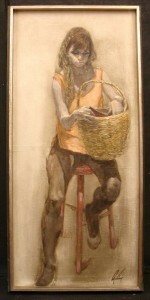 The tone of this work had been echoed in pieces painted by one of his two protégés, Joseph Ullery. Certain elements of style were used early on by the other, the late Victor Heady. If there are any questions about this artist or if you have any further information, you may contact us at collectedartworks(AT)hotmail(DOT)com.